Sometimes, I like to stuff my food so full of spice, it doesn’t know whether it’s coming or going. And this is almost always super tasty (i.e., curries, etc.). But sometimes simple flavours really are the best way to showcase a few phenomenal ingredients. Sometimes you don’t need to over-season a dish, because it’s just that wonderful the way it is. And this soup is that kind of dish. When I first saw the recipe, I was a little nervous that it would be bland, but it really wasn’t. It was almost ethereal – silky, flavourful, wonderful and so quick for a tasty weeknight dinner. I apologize for not posting sooner – I was away for the weekend, and beforehand I was making up a top-secret recipe that you don’t get to find out about for another week or so (don’t worry though, it will most definitely be worth the wait). I’d actually had this soup before – made by a lovely friend of mine who is a wonderful cook and that’s what got me to thinking I wanted to eat it again. The other thing that got me to thinking this was that I’d purchased a head of organic cauliflower at the market a week before and hadn’t yet bothered to do anything with it (the initial plan was to have it with pasta and a walnut pesto, but someone *cough*hubs*cough* ATE all the walnuts….so that plan went out the window). This recipe is great because it uses an entire (medium) head of cauliflower in a way that will convert even the most vocal and resistant cauliflower hater. My only pet peeve with the whole thing is with the onions. And this isn’t even limited to this recipe….it’s with all recipes calling for onions (which, if you have a looksee through my archives, is pretty much everything I make). Onions and I do NOT get along. Every time I cut them, I’m reduced to a tearful, blubbering mess. Every-freaking-time. You’d think a person would develop an immunity to this, but it actually seems to be getting worse. Also bad is me, stumbling around my kitchen (knife in hand), looking for something to mop up my streaming eyes. One of these days, someone is going to end up on the wrong side of that knife! I also like the fact that I end up looking like a raccoon thereafter. Meh. 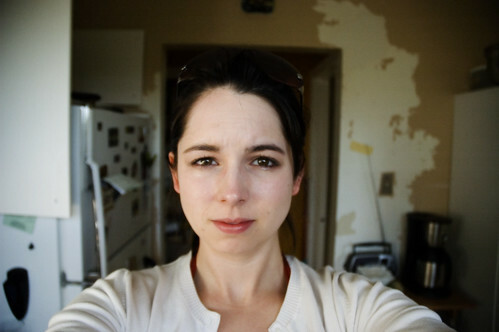 I was so annoyed with this onion debacle last night that I took a picture of my teary and grimacing face. Oh, and you’ll note the tender sprouts of kitchen renovation behind me and to the right…..all that peeling paint has GOT to come down (the results of someone painting latex over enamel paint and which we get the joys of doing something about……but the kitchen reno will be starting pretty soon and when it’s all done, you’ll be the first to see the results….but in the meantime, my kitchen is not so picture-perfect…). 1. Combine 2 cups water and 2 cups low-salt chicken broth in medium saucepan. Bring mixture just to simmer. Remove from heat. Add saffron threads. Cover and steep 20 minutes. 2. Melt butter with olive oil in heavy medium pot over medium-low heat. Add chopped onions and sauté until very tender but not brown, about 10 minutes. 3. 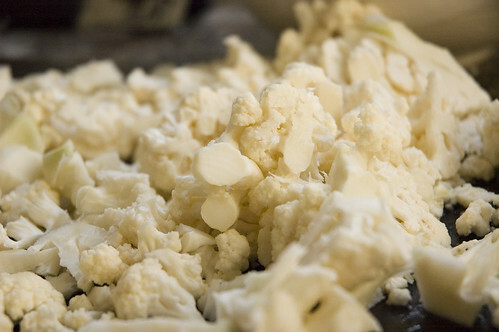 Add cauliflower pieces; stir to coat. 5. Bring to simmer over high heat. 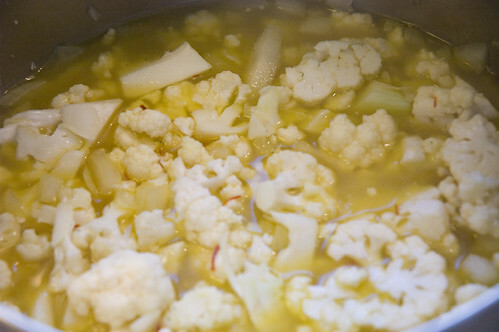 Reduce heat, cover, and simmer until cauliflower pieces are tender, about 20 minutes. 6. 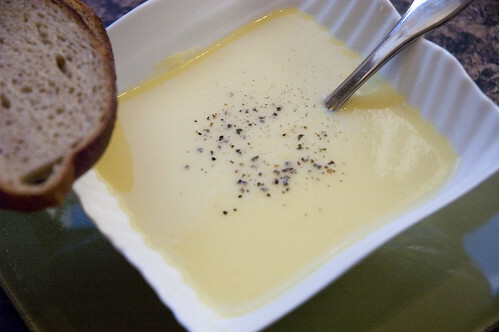 Use an immersion blender to purée the soup. 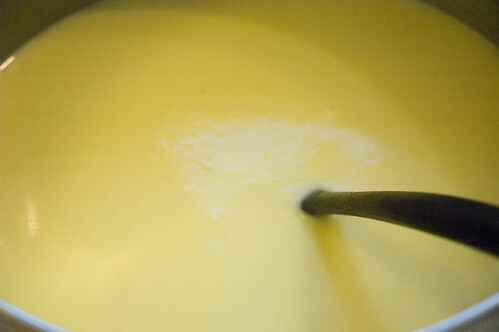 Stir in the cream. Taste and season, if necessary. It was the prettiest pale lemony yellow. And so creamy and yummy. ***This recipe can be made vegetarian through substituting veggie broth, and can be made vegan through using either puréed silken tofu or soy milk in lieu of the cream. I served this with toasted garlic rye bread (technique stolen from Janet of Janet is Hungry – a great blog you should check out) – just toast your bread, and then rub it with a cut garlic clove. Voilà – you have quick and easy garlic bread with no added oil/fat calories. Nice. I had no idea that garlic bread could be had with such ease and so small a caloric procie. This soup was really superlatively good. So silky, so yummy. It would be a great precursor to any dinner party or, as I had it, a nice light meal. It’s low-cal and yet somehow still SO satisfying. DEEEEEEELISHIOUS. Thanks for reading! 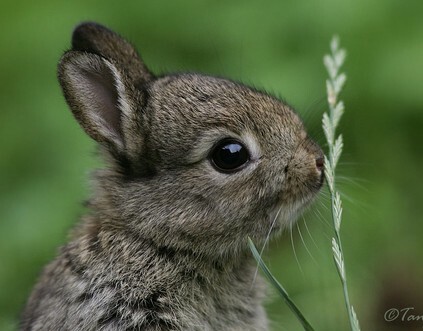 Hope everyone had a lovely weekend. 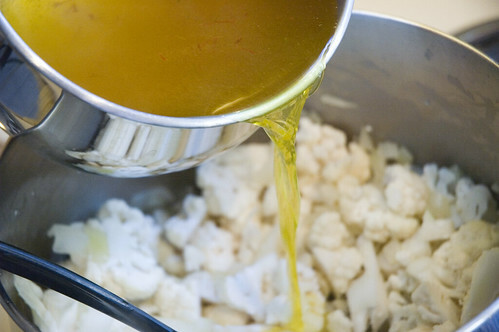 I think this bisque looks delicious - I love cauliflower! yum, that looks great! i've never tried cooking with saffron (because i'm such a cheapskate! ), but the colour is lovely. What is sprinkled on top of the soup? Is that more saffron? My sister just went out of town for a week and unloaded all of her produce on me - including a head of cauliflower! This would be a perfect way to use it. That bisque looks fantastic...I have always loved Saffron! We've been getting a ton of fresh veggies from our CSA. I can't wait to try this. Oh I love soup! This look sooooo good. I just got an immersion hand blender, hooray! Now I can make these kinds of soups without having to scoop everything into a blender, and then back into the bowls afterwards (which I did when making a roasted ginger squash soup). For onions, I keep mine in the fridge and also light a tea light when I am cutting them, I think it helps a lot, but maybe it's in my head, or maybe I just got faster at chopping them while squinting! I just read a little onion tip on another blog and thought of you! She says to chew on a piece of bread while cutting and it helps the tears. I'm going to try it out! How lovely! Thank you for this post. I can't take credit for this tip as I read it somewhere online, but it works really well for me. Chop up a few onions and place them in a big ziplock bag. I did it by hand, but you can use a food processor also - even by hand at least it gets all the teary-ness out of the way in one shot. Put the bag with the onions into the freezer, and every once in a while squash it around (so it doesn't freeze into one big onion blob). Once it's frozen, you can just take out as much as you need. This may not work well for dishes where the onion stays raw (the texture might change) but when you're cooking it anyway, it works! MMMmmm still as pretty as you always were. Yummy! I'm going to try this for sure. Hubby and I love soup. I almost fell off my chair laughing, when I read about your issue with onions. Glad to see that I'm not the only one. I can't touch the damn things...hubs has to do it for me often. Um, mad yums to this recipe. 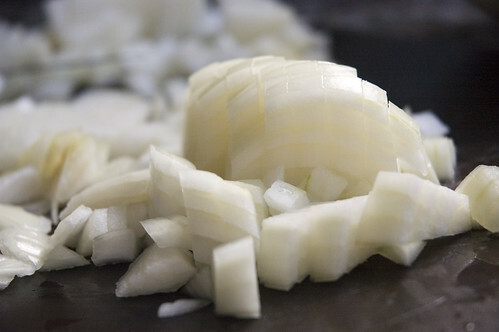 Try putting your onion in the fridge or freezer before chopping it. Or you could always wear google. Thanks for all the onion tips everyone!!!!!! The things you can learn from the great, wild internet!!!!!!!!!! patricia - thanks! I love cauliflower too! kickpleat - you should definitely try cooking with saffron. Paella should also be on your list! nightfall - it's actually just some cracked pepper, though saffron would be a very pretty garnish! seza - yes, you should definitely try it! samantha - soup is awesome. I love soup. donna - you will LOVE your immersion blender. I use mine all the time. Thanks for the onion tips! culinarily curious - ouch. that is hot. it's pretty sweltering here, but even at that it's only 84 (29C). jennifer - my hubby teases me ALLLLL the time about it. 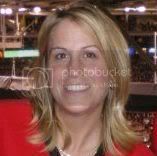 heather - thanks! can't really take credit for it, but it's absolutely lovely! plantchick - goggles, eh? If I wear 'em, I WILL post a picture. HAHAHAHAHAHA. Anyway, thanks for sharing a great recipe!! I like to keep an old pair of snowboarding goggles in my kitchen drawer for onion cutting. I look like a dork for a few minutes but it works EVERY time! I love onions, but hate the crying.